Brick, also called Bricktown, has a total area of 32 square miles and is located in the northern portion of Ocean County, New Jersey. It is a Jersey Shore community situated mostly on the mainland with three beaches along a portion of the Barnegat Peninsula that separates the Atlantic Ocean and Barnegat Bay. There is easy access to major roadways including the Garden State Parkway, and nearby public transportation via the New Jersey Transit Bus and Railway systems is also readily available for commuters and recreation seekers with service to the metropolitan areas of both New Jersey and New York, as well as Atlantic City, New Jersey. In 2006 Brick earned the title of “America’s Safest City” in the annual Morgan Quinto Survey, a nationwide survey that included over 371 cities. Brick residents and visitors enjoy recreational activities such as swimming, boating, jet-skiing, and fishing in both the Atlantic Ocean and Barnegat Bay. In addition there are an abundance of retail shopping centers and fine restaurants located in Brick and it is just a short drive to enjoy the many activities on the beautiful beaches and fun-filled boardwalks of the Jersey Shore. 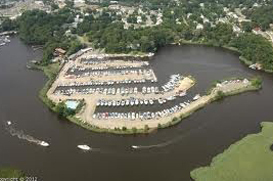 Nearby points of interest include Six Flags Great Adventure in Jackson, NJ, Jenkinson’s Aquarium in Point Pleasant Beach, NJ, beautiful golf and yacht clubs, boardwalk amusement rides and carnival games, and live entertainment at numerous waterfront restaurants. The total population of Brick is 76,099 but increases during the summer months when part-year residents return to enjoy the humid subtropical climate. In July the daily high temperature reaches an average of 85 degrees Fahrenheit. In contrast, the climate during winter months is cold with daily temperatures reaching an average high of 40 degrees in January. The median age of residents is 40 and the average annual household income is $81,369.00. The median home price in Brick is $225,000.00 although there are homes for sale in almost any price range including numerous luxury and waterfront properties.